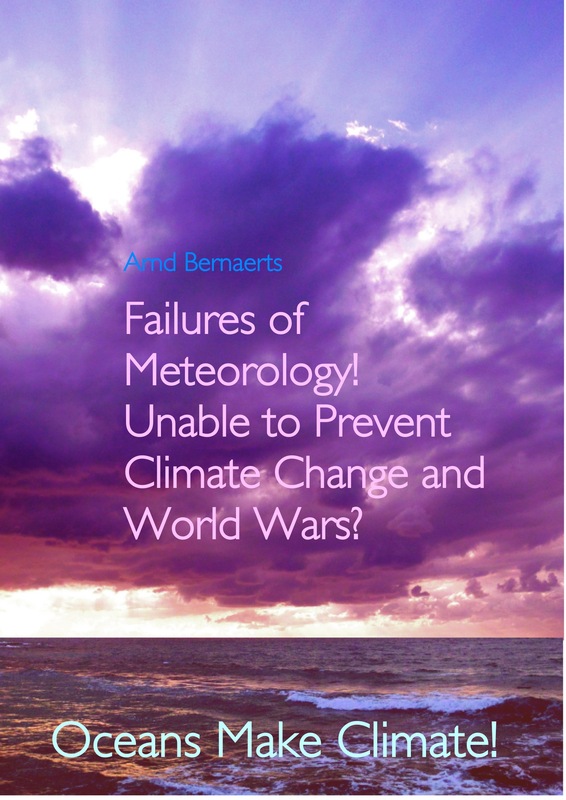 FAILURES OF METEOROLOGY! UNABLE TO PREVENT CLIMATE CHANGE AND WORLD WARS? OCEANS MAKE CLIMATE! The Second World War stands for the criminal madness of the German Nazi government. Less known is their responsibility for the only climatic shift from warm to cold in an otherwise constantly warming world over the last 150 years. The three war winters of 1939/40, 1940/41 and 1941/42 mark the change. The regions that had been closest to intense naval war activities, Baltic and North Sea areas, immediately experienced the coldest winter in one 100 years. For this to happen, man needed only four months since commencing the Second World War (WWII) on September 1st 1939 not only during the first but also the second and third war winter. Europe �s winters were back in the Little Ice Age. After Japan had attacked Pearl Harbor on December 7th 1941 the naval war became a global affair lasting until August 1945. In close conformity with the naval war in European seas, and globally subsequently, a pronounced global cooling took place, which lasted over three decades until about the mid 1970s. Not one weather forecast had expected an exceptionaly cold winter. 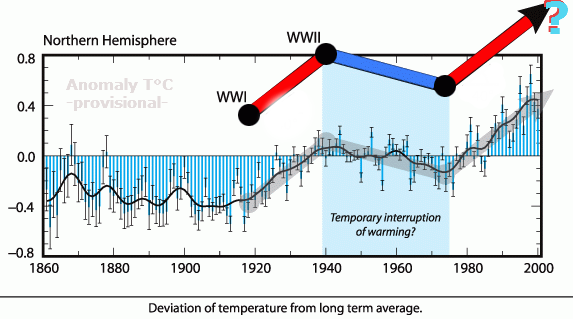 Since the middle of the previous century the winters had become milder over the time. The Englishman A.J. Drummond expressed his astonishment in 1943: �The present century has been marked by such a wide-spread tendency toward mild winters that the �old-fashioned winters�, of which one has heard so much, seemed to have gone for ever�. At the same time the Swede G.H. 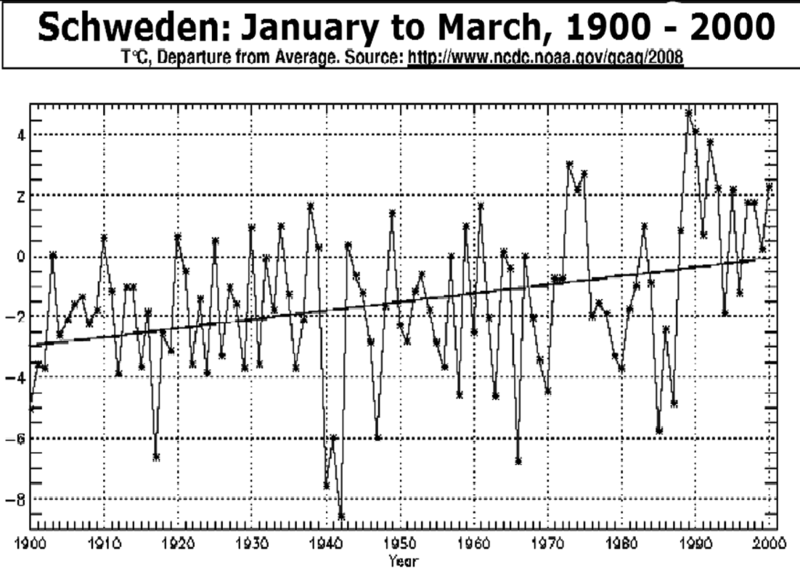 Liljequist ascertained that such a series of three consecutive cold winters in Stockholm had never been observed, while the German M. Rodewald (1948) wondered that the pronounced, 'secular heat wave' since the 19th century had been interrupted so suddenly by three consecutive severe winters. However, a connection with the war at sea had never been recognized. Neither the three mentioned experts, nor their colleagues, nor the ten thousand climatologists of following generations noted the connection. 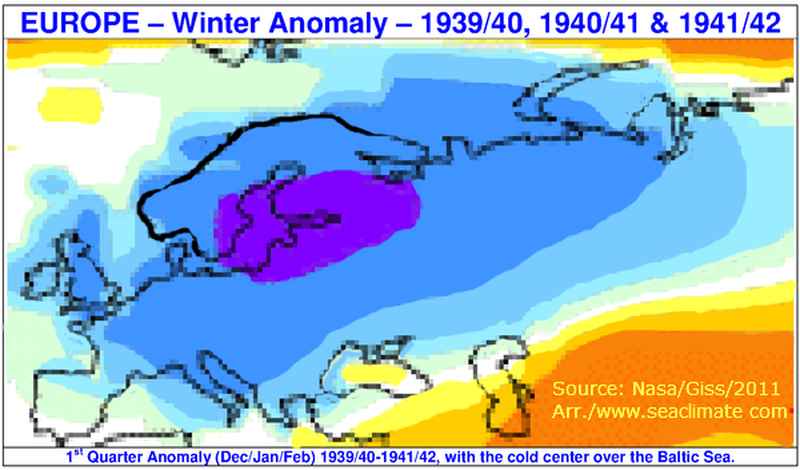 The biggest climatic change since the industrial revolution, its debut in the winter of 1939/40, and the subsequent three decades lasting cold period are still a mystery in climatology. There are plenty of signs of a close timely correlation between the naval war and the three extreme winters. Many observations, whether concerning rain, wind, temperature, and the sea ice formed in the North Sea and the Baltic, indicate answers for its cause, like the fact that for the first time since 1883, the Baltic was fully covered by ice. Temperatures plunged very deep particularly in regions, which were covered by the most intense naval warfare. The "naval war effect" is clearly visible during the winter because the seas and coastal waters north of the English Channel exchange the heat they have stored during the summer season with the atmosphere. North of the Bay of Biscay the influence of the sun on winter weather in Northern Europe is low, that of the ocean and seas comparably mighty. � __Drummond (1943): "Since the beginning of comparative observations in 1871, there have been only three consecutive winters (1939/1940, 1940/1941 and 1941/1942) that were as snowy as this, i.e. 1915/1916, 1916/1917 and 1917/1918. " � __Oestman (1941): "Very rarely are two severe ice winters directly followed one after the other - since 1870 when regular ice observations started in Sweden . Except for the last two winters, these are -1939/40 and 1940/41 the only other cases are 1915/16 and 1916/17." How would Mr. Oestman have expressed his astonishment, if he had also written the next sea ice report for the Swedish weather service? Instead of that the already mentioned G.H. 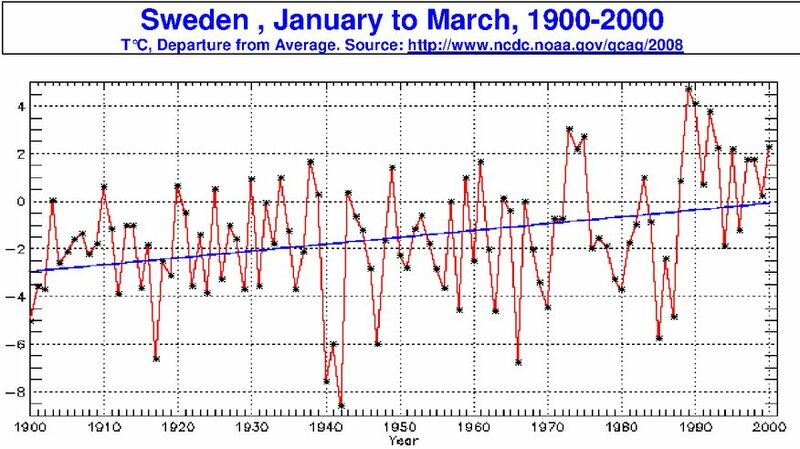 Liljequist who was in charge, noted that the third war winter 1941/42 was colder than the previous two winters, and the coldest in Stockholm since 1756. The reason is not too difficult to identify: The German invasion of the Soviet Union since June 22nd 1941, which included a seven month battle for supremacy in the eastern Baltic between the German Navy and the Baltic Fleet, until heavy sea ice prevented any further naval activities by the end of January 1942. Climate is the continuation of ocean by other means. and North- and Central Europe: a sub-polar North Atlantic matter? 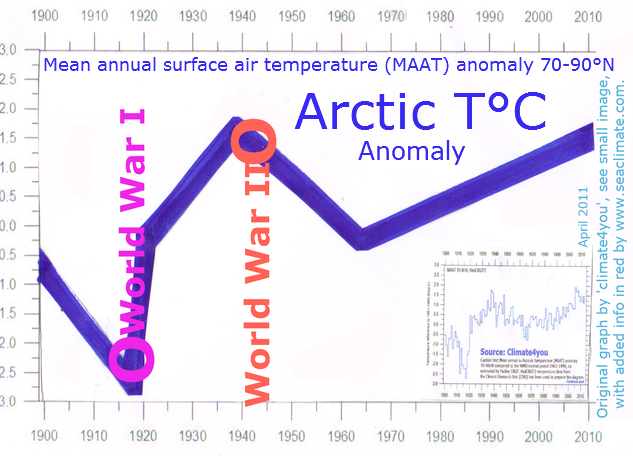 The differences indicate that cooling from 1940 to 1970 has been influenced by the Atlantic . The next section shows more trend images from European countries, which confirm this.